Hello Cheerio offers a lovingly crafted wedding collection in a variety of designs for your special day. 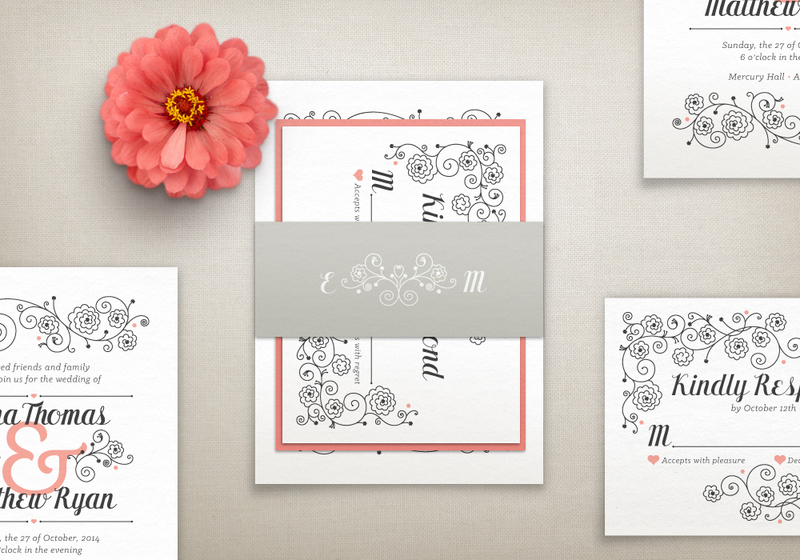 Each collection suite features beautiful typography, tasteful design, and can be customized in your wedding colors. Please visit us on Etsy to order sample invitations or to place an order. We look forward to creating something special for your big day! Wedding collection orders start at $300 for 50 invitations and reply cards digitally printed on 110# smooth white or cream paper with coordinating blank envelopes. Each custom order includes your choice of wording, print colors, paper selection, envelope color(s), digital proofs and up to two free rounds of revisions. Additional pieces within our wedding collection are available à la carte for each design, including: insert cards, menus, table numbers, place cards, programs, thank you cards, save the dates, and belly bands. Please contact us for pricing. Prior to placing a full order, we recommend purchasing a sample of the design(s) you are interested in to see the print quality, paper options, and print colors in person. When you are ready to place a full order, please contact us with the design style you have chosen, which pieces you are interested in ordering, and quantity. We will email you a quote for your entire order and create a custom listing for your deposit (1/2 of total). The deposit payment will be applied to your final balance, which is due before printing begins. It is customary to mail out wedding invitations 6-8 weeks prior to your big day. We recommend placing your full order at least 6 weeks in advance of when you plan to send out your invitations (at least 8 weeks in advance for International orders). This will allow ample time for design, necessary revisions, production, shipping, and preparing your invitations to mail. ©2016 HELLO CHEERIO. ALL RIGHTS RESERVED.